Well Go USA recently send us information for the upcoming "The Phantasm Collection" 6 Blu-Ray set. The set will feature "Phantasm Remastered", "Phantasm II", "Phantasm III: Lord of the Dead" "Phantasm: Oblivion", Phantasm: Ravager" and a bonus sixth disc. "The Phantasm Collection" hits theater on March 28th. One of the world’s most popular franchises in the history of horror, the Phantasm film series has terrified fans for generations. 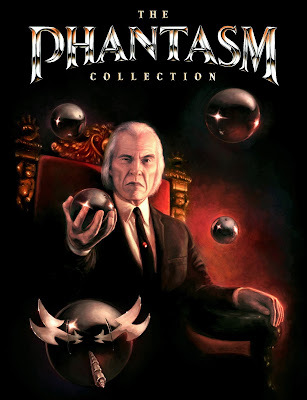 Well Go USA Entertainment answers the prayers of those fans with the highly anticipated release of THE PHANTASM COLLECTION, a six-disc Blu-ray™ box set debuting on March 28. The collection features all five frightening films in the series – PHANTASM: REMASTERED (1979), PHANTASM II (1988), PHANTASM III: LORD OF THE DEAD (1994), PHANTASM IV: OBLIVION (1998) and the most recent installment PHANTASM: RAVAGER (2016). In all five films in Don Coscarelli’s iconic series, Mike (Michael Baldwin) faces off against a mysterious grave robber known only as the Tall Man (Angus Scrimm) and his lethal arsenal of terrible weapons. 13 years after the original nightmare began, Mike must cross dark dimensions of time and space to discover his origins and those of his nemesis, the evil Tall Man. With only his loyal friend Reggie at hisside, and the spirit of his dead brother to guide him, Mike must finally confront this malevolent embodiment of death. Prepare to be scared witless as the fine line between the living and the dead snaps with a vengeance! PHANTASM IV: OBLIVION has a runtime of approximately 90 minutes and is rated R for horror violence/gore and some strong language.